Whenever we travel, we try to rent a house or apartment if we will be staying more than a few days. This isn’t always easy, but I try to do it when we can. It is a safe haven from the chaos of traveling. It also throws us directly into a new city. We get to see the comings and goings of our temporary neighbors. We aren’t stuck in a financial district or out by the airport. We get a whole lot more space for our money too. Generally I have been able to find a two-bedroom rental for the same, and sometimes even less, than a small hotel room in the same area. If Internet is available, it’s generally included in the price of the rental. No added surcharges. Parking has also been included in all of the properties we have needed it. Having access to a kitchen saves us a lot of money too. Milk doesn’t spoil. Leftovers aren’t wasted anymore. A washer and dryer are a bonus when traveling with a kid. The less I have to pack the better. If I can throw a load of laundry in before we walk out the door for the day, I’m a happy mama. 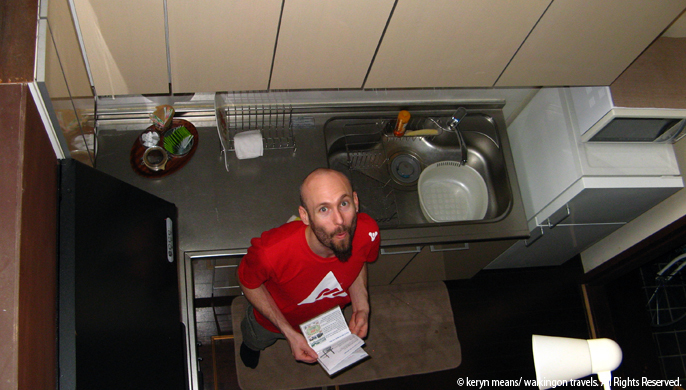 In Japan, hotel rooms can be extremely small. I wanted a little privacy and space after sharing a room with my son for 2 weeks in China. I knew my price range. I headed straight to my favorite rental site, VRBO.com. Before hitting VRBO, I researched the city and figured out where the sights we wanted to see most were located. Having my list in front of me helped narrow down the neighborhoods I searched. I quickly found 2 different properties in our price range and one just slightly out. Of course I fell in love with the most expensive one. 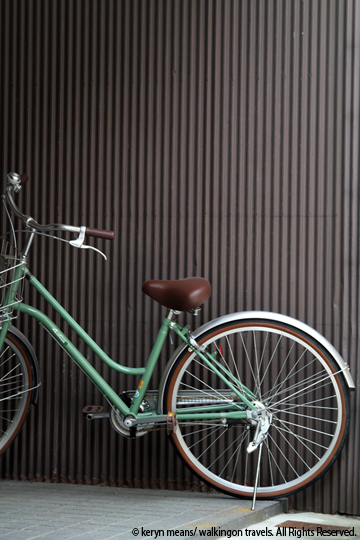 It was a rehabbed machiya on a quaint cobblestone street in Kyoto. It was called Maeniiya. A machiya was the traditional townhouse of the merchants in Kyoto. The business was in the front while the family lived in the back. Over the years, many of these homes have been torn down to make room for other structures. There is a growing interest in preserving this type of architecture in the city, which is what the owners of Maeniiya did in 2007. 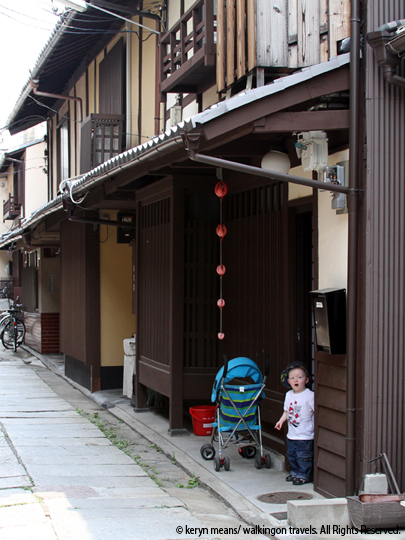 It still possesses the charm of a traditional machiya, but also includes some modern amenities this mama loves. Like wi-fi and a washing machine. It was close to a grocery store and on the western end of the main shopping area of Shijo-dori. 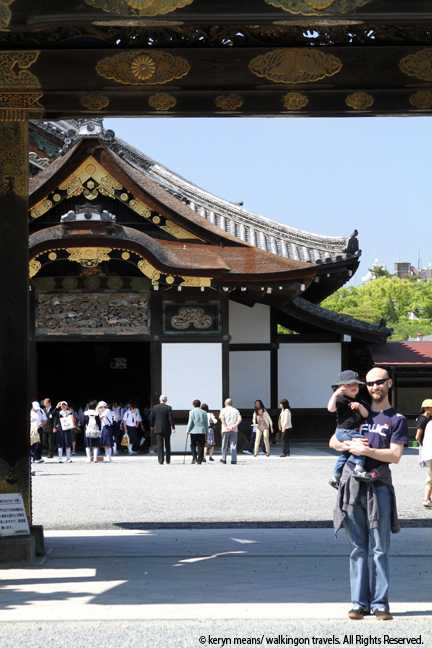 It was within walking distance of one of the major food markets and Nijo Castle. I thought it was too picture perfect to not inquire about at least. I sent off a quick email to ask about the dates, and immediately heard back from the owner, who lives in British Columbia. The dates were free. After a few emails back and forth we were able to agree on a price that was within my budget. Money was sent and we were set to go. I’m always a little nervous when I first arrive at a rental. Whenever you haven’t seen a place you take a risk. There are enough scam artists out there to make us all a little wary. I’ve never been taken advantage of, but there is always that chance. Happily Maeniiya was even more beautiful in person than it was in pictures. We could not have asked for a better place to stay. The owner’s sister, Miho, was waiting for us when we arrived. She helped us get our bags in, gave us a quick tour and handed us the instruction book for the home (how to use the washer/dryer, when to take the trash out, how to turn on the cable, etc.). She then pulled out a map and started circling where all of the grocery stores were, and how to get to the nearest bus stop and subway entrance. She told us to call her if we had any questions or needed anything at all. It was just like having a friend welcome you to the city. We were not totally alone. The ground floor sported a living room with a TV and a traditional (low) table with cushions, an entryway, fully equipped kitchen and the bathroom area. I have to say “bathroom area” because the toilet was in one closet, the shower was in another and the washing machine was out in the main section of the bathroom along with the sink. I loved it. We could get so much more done and not get in each other’s way. Compared to our tiny bathroom at home this was heaven. My new dream bathroom. Everything separate so I get more done. The second floor had 2 bedrooms. A fun quirk was that you could open a small window in each bedroom and look down at the kitchen. Very handy when I needed Mike to bring something upstairs. The bedrooms were outfitted with traditional futon mattresses on the floor. They were the most comfortable beds I had slept on in Asia. Not soft, but much less firm than the beds in China. About the same, if not better than the beds at The Fraser Residence Osaka. The 2nd bedroom, which was smaller than the main bedroom, also had a desk with a computer available for use. I had brought my laptop, so I took full advantage of the free wi-fi to write posts about our trip and Skype with family. Dek’s room (2nd bedroom) stayed dark in the morning since it faced west. Unfortunately our room faced east so I was up at 6am with the sun. Some mornings Mike or I would crawl into the bed in Dek’s room (he was in his travel crib), just to get a few more minutes of sleep in the dark. Master bedroom (left) and 2nd bedroom/den. Just enough room for a family of 4. Two things that worried us about the house were the stairs and the screen doors. We live in a one-floor house back in the States. Dek isn’t used to going up and down steps. The stairs were also a bit slippery in the machiya. With some coaching we were able to convince Dek that he should not go up the steps without us. After a few days he did start to test the waters though. The screens looked like they were made of rice paper in the pictures on the rental listing. Happily they were not. No worries about Dek walking through them. We left the house in one piece. The neighborhood was quiet. We left the house each morning with the regular commuters. No cars could fit up our tiny alley. Dek was free to run. We only had to beware of bicycles and the occasional moped. The house did supply bikes for us to use, but they did not have a kid seat available. We opted to walk or take the bus most places. A bus stop to most of the city’s major sights was a short 5 minutes away. I very quickly became familiar with the landmarks (Fresco grocery store and big yellow building) so we would get off at the right stop on our way home. Most days we just took our time walking back, but sometimes this mama was too tired to move another inch. Knowing I faced a 20-minute walk or a 5-minute bus ride home made the choice very easy some nights. 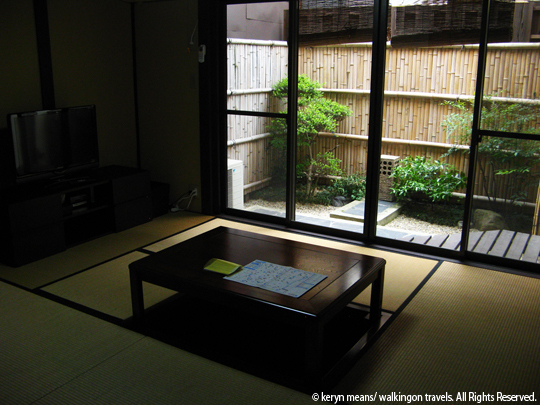 I am thrilled that we found such a beautiful, traditional home to spend our week in Kyoto. The extra money for this particular property was well worth it. I can think of no better way to experience life in another country than by living like a local, even if it is just for a few days. Note: I was in no way compensated or asked to write a review or mention any of the links in this post. This is simply my opinion based on our stay and what I found useful in the planning process.